ANNOUNCEMENT: Congrats to Terressa for winning the $20 gift certificate! Our friends at Jennifer Lynn Events are offering a giveaway on their site that we wanted to share with you! 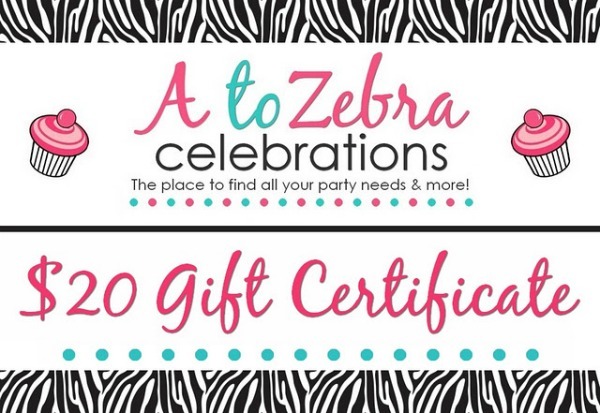 From now until Saturday, February 21, 2012 at 11:59 EST, you can enter to win a $20 Gift Certificate courtesy of A to Zebra Celebrations. The Etsy shop of A to Zebra Celebrations is "the place to find all your party needs and more!" I love their collection of banners and table runners - a MUST have for your next party or event! If you'd like to participate in this giveaway, please visit Jennifer Lynn Events for information on how to enter. The winner will be announced on Sunday February 22, 2012.